The cereus acquired last summer has produced its first bloom. The second of the two pictures below was taken after sunrise, with natural light. The aqua backdrop is a pool cover. The plant is growing some new leaves, but there are no additional buds at this time. aI found your web-sight last week and your information has been a great help to me. It is July 3,2008 11:35pm and finaly everyone has left my house. The event here was to watch two 10" milk white blooms open. Thet started to open at 7:30pm and the sun was still hight in the sky, and by 9:00pm were fully open to 10 inches with a smell that we could not believe. This is a very old plant, it was given to me in 2001 and was brought from th mid west around 1980. My frind had it from 1986 to 2001. It bloomed for her two times. There are 3 more blooms ready to open and I counted around 5 to 8 more coming. We were able to get some great pictures and I would love to share them with you. My e-mail address is Valleyridgeltd@aol.com and my name is Cheryl Thenks again for having a great web-sight about this wonderful plant. I so enjoy your website. I posted today about our 25 year old cereus that moved from the warmth of Texas to the chilly Northwest 17 years ago. It has only been in the last 2 years that we've had blooms. I finally discovered what the lighting requirements were and we are now getting buds. The first of the 2008 season opened last night and I was mesmerized after so many dry years! What a wonderful, primitive amazing plant this is! Thanks for providing so much helpful information and so many beautiful photographs on your site. I'll be visiting regularly. your photos are so amazing!! I want a camera like that!! Please come see my megger phone camera shots. I thought were cool, but Yours are so amazzing!! 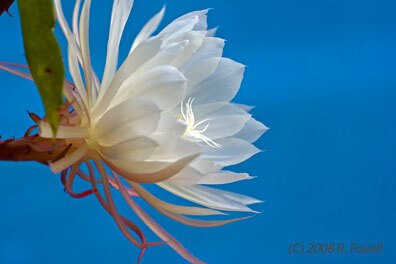 I recently enjoyed my cereus bloom with 11 blooms opening at one time! That was a new record for me! There were 20 blooms all together and the rest will be blooming this week. The plant is about 20 years old and we had a hail stomr a couple of minths ago that I thought had ruined it. I think it shocked into blooming! I have another plant that has 8 buds on it also. I am just sorry that most people won't come see it because they think it's too late! I told them I could take all the pictures in the world, but couldn't capture the smell which is so wonderful! Would love to share some pics with you! That would be awsome if we could capture the fragrance along with the amazing blooms. now that would be to die for, eea? But then there would be nothing left to the imagination... THank you again for sharing your beautiful Photos! While there are a few plants that produce similar blooms which either open/persist during day or last more than a few hours, my plant -- and presumably yours -- is not like that. 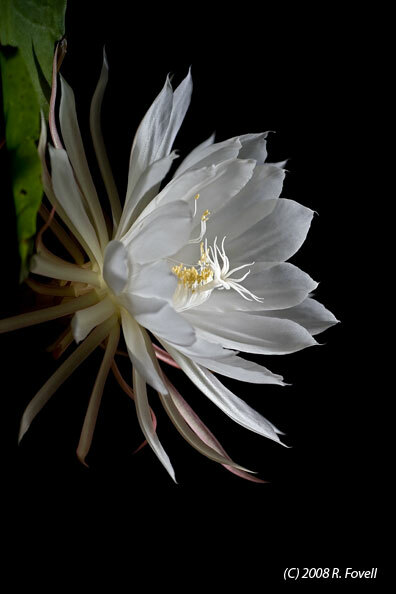 My plant's flowers open after dusk, and close either just after or just before sunrise. I'm not botanist, but I don't know why this plant even bothers to produce flowers at all... mine has never generated any seeds. It propagates by pushing up new stalks, cretaing new "colonies". I have a cereus that was in my grandmothers house in the '50s. I take cuttings for friends and family. I have been surprised to hear that everyone thinks that these plants have to be a few years old before they bloom. I take cuttings in the fall, place them in a vase and roots grow during the winter. I plant them in the spring. They always thrive and grow quickly: three to four feet by blooming time. They always have multiple blooms that first year. Re: Why should they even bother to bloom (when they grow so easily)? The answer lies in their native habitat, perched high in the crooks of trees where there is little substrate and few nutrients. They really can produce seed, if you happen to have night flying moths around to fertilize them! The seeds are then carried by tree dwelling creatures (birds, etc) to new potential real estate opportunities. I'm no botanist either (merely an avid reader); but presumably this is also what led this cactus to wind up living in a tree? What a study in adaptation! I'm in the midwest so have had an indoor plant. It bloomed for me on family birthdays too. A great surprise fregerance when you aren't expecting it.Is it related to the Easter lily in the fregerance? This first one finally died and I just replaced it through Woman's Day Mag. purchase a year or so ago. I have it in bright sun as I saw them growing in Hawaii on a hill in the bright sun. What is the recommended fertilizer and "force blooming" techniques besides being pot-bound you have used?